Commandment #4–Do it Once; Do it the Right Way–the First Time. 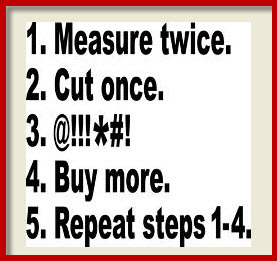 In carpentry, the first rule every beginner is taught is: MEASURE TWICE, CUT ONCE! Similarly, dentistry requires the same attention to detail. If one follows my preceding three dental “Commandments“, the prognosis for their teeth can be pretty solid long-term. For most dental patients, I recommend that they have needed dental work accomplished in as few steps as possible–Do it once; do it the right way the first time in order to avoid multiple procedures. For example, if a tooth needs a crown (Commandment #3), then I may be able to patch it with a filling, but will have to treat the tooth again in the future to protect it with a crown. Treating a tooth twice means twice the risk of injury to the nerve in the root canal of the tooth–since every time a tooth is damaged, infected or restored (“filled”), the nerve inside the tooth is injured/inflamed and must heal. That can happen only so many times before the tooth is irreparably damaged and gives up the ghost–leading to extraction. Fig. 1 Check out the “new” roof. Sometimes the patch doesn’t “quite” match the original. I advise my patients that the amount of dental care they need will be directly proportional to the amount of dental work they needed (or should have had…) while in their teenage years. Every 20 years or so, they will need to have the dental work updated or replaced–just like those “20-year” shingles on a roof. Now, I can hear all the nay-sayers out there saying, “Ha! Well my dentist did a great job–my fillings have been there for almost 30 years.” To that, I say, “Please refer back to previously discussed Commandment #1 and Commandment #2, because nothing lasts forever and to maximize long-term predictability of dental care, one must be preemptive in its maintenance. Though the patched roof in Fig. 1 may not match or look as good as the original (it may be part of a long-term replacement plan by the owner), it should function well until the rest of the project can be completed. For the patient in Fig. 2 and 3, I created a phased treatment plan so that all the procedures needed for his extreme dental makeover (and thus the expenses!) were accomplished over a 7 year period to permit numerous travel opportunities for him and his wife and necessary delays to allow for orthodontic therapy, sinus augmentation and implant healing time. 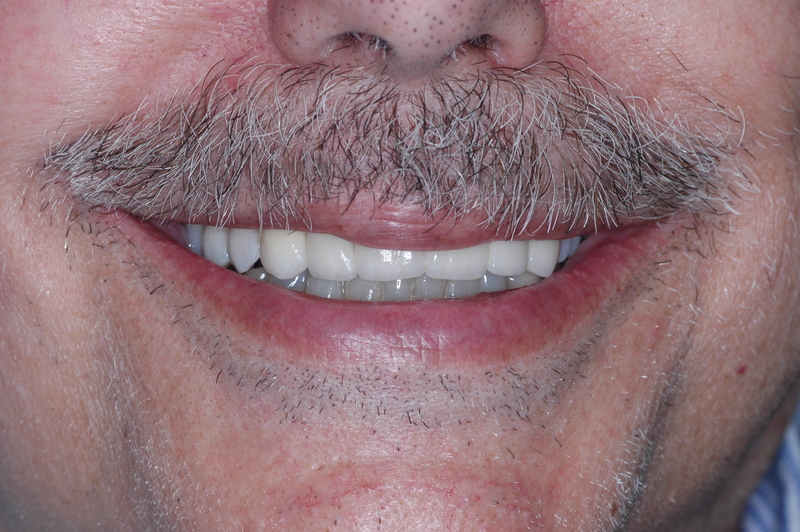 The important part was that he completed his goals on HIS time schedule; got the cosmetic and functional result he desired and each tooth was only restored once! The only time that a “phased” approach to care doesn’t make sense is when one or more teeth must be touched multiple times unnecessarily. It’s not a mandate, but merely advice to avoid increasing the risk of complications. Remember: Commandment #4 really means that the more times a tooth is touched, the more likely one is to lose the tooth! So, if you are in need of extensive dental care, ask your dentist if the option of a phased approach to care would be best for you. If your dentist cannot answer that question to your satisfaction, give my office a call and schedule a consultation appointment to discuss your needs–I’ll do my best to provide sound advice. Either way: Do it once; do it the right way–the first time. This entry was posted in Lifetime Dentistry, Restorative Dentistry and tagged best dentist in Nashua, best dentist in NH, dental art, dental crowns, dental fillings, dental implants, dental insurance, dental materials, dentist, dentist in nashua, family dentistry, fillings, general dentistry, implant dentistry, nashua dentist, nashua dentistry, preventive dentistry, sleep apnea, top dentist in Nashua, woodcarving on January 13, 2016 by sfbdmd. As the old proverb guides us: no one plans to fail–they just fail to plan. In that vein, my goal is to provide my patients with a treatment plan for high quality dentistry based upon estimates of longevity–for both the patient and the restorative material. Bottom line: if one wants to keep one’s teeth, treatment must be completed BEFORE it hurts and BEFORE the tooth breaks–that is, BEFORE there is any symptomatic reason to do so. The reality is that, sometimes, even modern dental techniques can’t save a fractured, infected tooth. The alternative to this rule is to relinquish the personal control and timing of preemptive care and subject oneself to the rigors of rescue dentistry (to be discussed in Rule of Thumb #4) after the tooth/teeth become symptomatic. Rescue Dentistry is the “bread and butter” of the General Dentist–because the need for treatment is now obvious to the skeptical patient and “required” for the relief of pain and/or suffering. For the dentist, the dreaded “sales pitch” is now unnecessary–there is nothing more to prevent or preempt; for the patient, there is now a complete loss of control over the ability to plan and the freedom of choice; for the tooth, it may be too late; and for the wallet, whether there are remaining dental benefits or not, is a moot point. I like to refer to these teeth as: Christmas Eve Teeth–I think the reason should be reasonably self-explanatory. 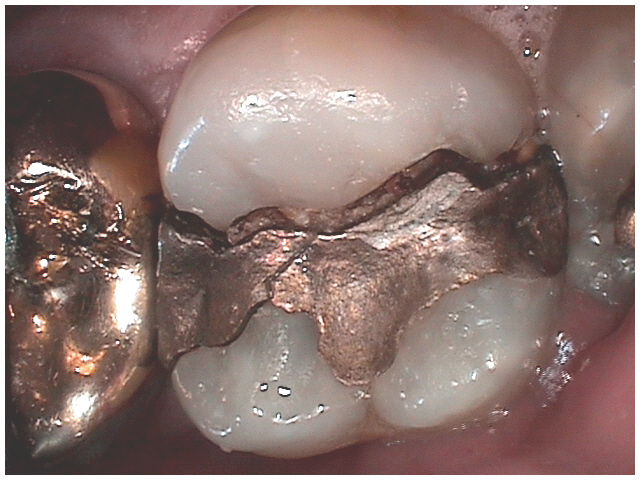 Figure 1: Silver amalgam weakens teeth and oxidizes with time, changing the physical and chemical properties of the material.. Though it can be effective, rescue therapy is less predictable, more extensive, more expensive and much shorter-lived. The most complicated treatments that my patients need are a direct result of the long-term reliance upon short-term dental treatments based on silver/mercury amalgam fillings or tooth-colored plastic fillings and sealants. Why do we change the oil in our cars every 3-4000 miles? We could just wait and replace the engine every 15000 miles when the engine seizes and save two or three trips to Jiffy Lube! Figure 2: Even bonding isn’t perfect! Bonding cannot be relied upon to resist the forces generated between the jaws. 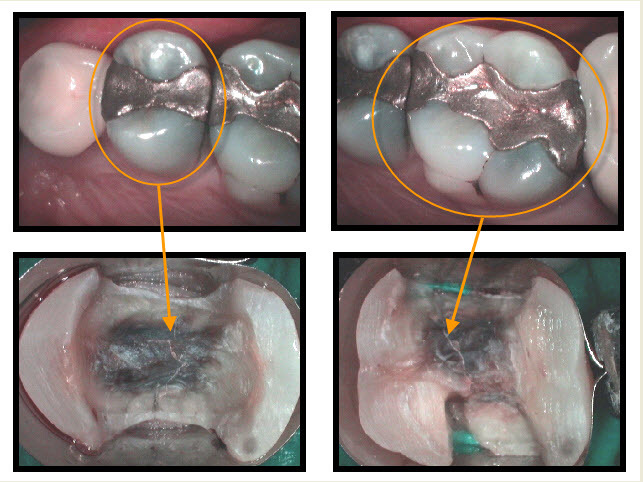 Fillings merely replace the parts of the tooth destroyed by tooth decay. Fillings work pretty much the same way. If one waits too long to update or upgrade a filling, the tooth will “seize” (see Figure 1 and 2) by fracture or root canal abscess. 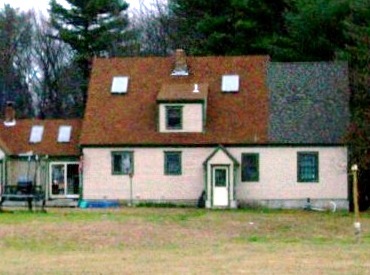 Rather than wait for the bitter end of a filling’s life, it would be preferable and more predictable to replace it when the first signs of deterioration are evident. The tooth in figure 1 above was identified 6 months earlier as old and potentially weak. 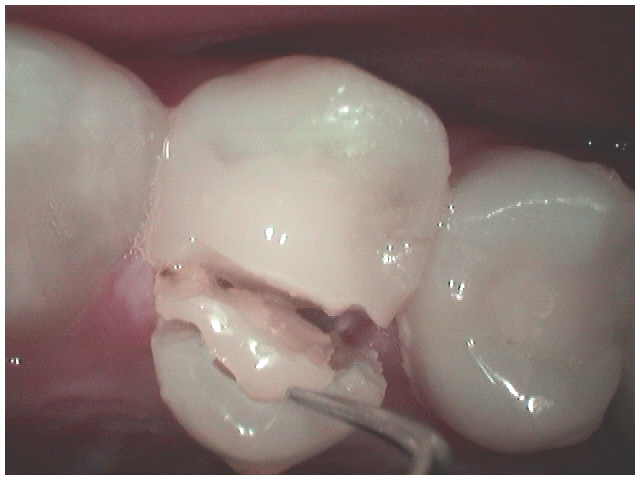 Figure 2 shows a fractured tooth with a moderately sized tooth-colored, bonded composite filling. 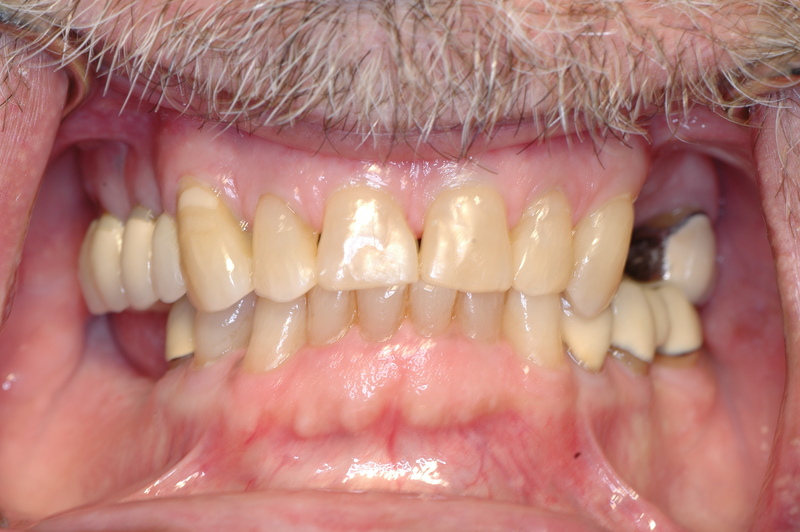 The patient with the teeth in figure 3 had been advised to have them crowned 4 years earlier due to the deterioration and age of the fillings (both more than 20 years old). The molar (larger tooth on the right side of figure 3) was completely split down the middle–the patient delayed treatment because THERE WAS NO PAIN, NO SYMPTOMS. When the patient finally “caved” to my recommendations (“badgering” in his words!) and agreed to update his dental work, the molar needed to be removed because the crack (and bacteria) had extended into the root canal and split the root. Cost is often cited as a barrier. Six months beforehand, the tooth in the figure 1 above could have had a new filling (~$250), or a crown ($1200-1500). Now that the tooth is fractured and painful, the restorability of the tooth is in question and the rescue therapy to correct it will cost ~$3500 (including gum surgery, root canal therapy AND build-up and crown). The out-of-pocket cost will be roughly $2500, or 10 TIMES the total cost of the new filling with no benefits. If the tooth cannot be saved, the tooth can be removed and replaced with an implant: ~$5000. Wouldn’t it be cheaper and better to just change the oil? This entry was posted in Lifetime Dentistry, Restorative Dentistry and tagged dental implants, dental insurance, dentist in nashua, family dentistry, fillings, general dentistry, nashua dentistry, preventive dentistry, sleep apnea on April 20, 2015 by sfbdmd.